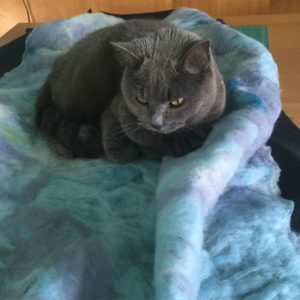 I promised to update you on the nuno felting results. This quilter just adores the water color, layered effect that nuno felt gives to my tops. 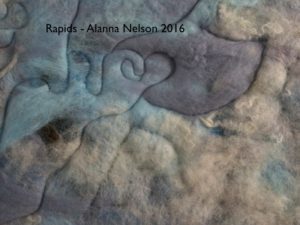 Equipped with roving in greys, natural off whites and blues, I actually completed one quilt with nuno felting yardage in April. Attempting to represent moving water while still honoring the wooly origins of my materials, I placed needle felted “rocks” underneath a portion of the quilt top and then needle felted it to a suiting weight wool border. With several nuno felt pieces in hand, I headed over to Laurena’s Longarm Quilting and experimented with different battings and threads. Hand quilting is imperative for certain portions of the quilt… it “moved” in just the right way. Here’s a detail of Rapids…. And now back to the next episode of watery themed quilts. Time to dye some wool.